The Chief Executive of the Hong Kong Special Administrative Region is the representative of the Hong Kong Special Administrative Region and head of the Government of Hong Kong. The position was created to replace the Governor of Hong Kong, the representative of the Monarch of the United Kingdom during British rule. The office, stipulated by the Hong Kong Basic Law, formally came into being on 1 July 1997 when the sovereignty of Hong Kong was transferred from the United Kingdom to the People's Republic of China. The functions of the Chief Executive (CE) include nominating principal officials for appointment by the Central People's Government of China (State Council), headed by Premier, conducting foreign relations, appointing judges and other public officers, giving consent to legislation passed by the Legislative Council, and bestowing honours. The Basic Law grants the Chief Executive a wide range of powers, but obliges him or her, before making important policy decisions, introducing bills to the Legislative Council, making subsidiary legislation, and dissolving the Legislative Council, to act only after consultation with the Executive Council (all of whose members are the CE's own appointees). The Executive Council consists of official and non-official members, including the Chief Secretary of Hong Kong, the most senior official and head of the Government Secretariat, in charge of overseeing the administration of the Government. The Chief Executive holds the title "The Honourable", and ranks first in the Hong Kong order of precedence. 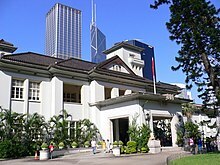 The official residence of the chief executive is Government House in Central, Hong Kong Island. The current Chief Executive is Carrie Lam, who was selected on 26 March 2017, appointed by the Central People's Government with the State Council Decree signed by Premier Li Keqiang, on 11 April 2017 and took office on 1 July 2017. She is the first woman to serve as Chief Executive. According to Article 44 of the Basic Law, the Chief Executive must be a Chinese citizen as defined by the HKSAR Passports Ordinance. The individual must be at least 40 years old, a Hong Kong permanent resident who is a Chinese citizen with right of abode in Hong Kong, and has ordinarily resided in Hong Kong for a continuous period of not less than 20 years. Article 47 further requires that the Chief Executive be a person of integrity, dedicated to his or her duties. In addition, since the 4th Chief Executive term, candidates may not stand for selection by the Election Committee without first obtaining 150 nominations from its members. The Chief Executive is elected from a restricted pool of candidates supportive of the Central Government by a 1200-member Election Committee, an electoral college consisting of individuals (i.e. private citizens) and bodies (i.e. special interest groups) selected or elected within 28 functional constituencies, as prescribed in Annex I to the Basic Law. In the first election of the Chief Executive, the Committee consisted of only 400 members. It was expanded to 800 for the second term. As a result of enabling legislation stemming from a public consultation in 2010, and its approval by the National People's Congress Standing Committee in Beijing, the number of representatives was increased from 800 to 1200. The functional constituencies correspond to various sectors of the economy and society, each of which hold their own internal procedures to select electors. The chosen Chief Executive must be appointed by the Central People's Government (State Council) before taking office. According to Article 46 the term of office of the Chief Executive is five years with a maximum of two consecutive terms. If a vacancy occurs mid-term, the new chief executive's first term is for the remainder of the previous Chief Executive's term only. The method of selecting the Chief Executive is provided under Article 45 and Annex I of the Basic Law, and the Chief Executive Election Ordinance. According to the Chief Executive Election Ordinance, the winning candidate in the Chief Executive election shall, within 7 working days after the election, publicly make a statutory declaration that he or she is not a member of any political party and will not become a member of any political party or do any act that has the effect of subjecting himself to the discipline of any political party during his or her term of office. Under the Basic Law the Chief Executive is the chief representative of the people of Hong Kong and is the head of the government of Hong Kong. The CE's powers and functions include leading the government, implementing the law, signing bills and budgets passed by the Legislative Council, deciding on government policies, advising appointment and dismissal of principal officials of the Government of Hong Kong to the Central People's Government (State Council), appointing judges and holders of certain public offices and to pardon or commute sentences. The position is also responsible for the policy address made to the public. The CE's powers and functions are established by Article 48 of the Basic Law. The Executive Council of Hong Kong is an organ for assisting the Chief Executive in policy-making. The council is consulted before making important policy decisions, introducing bills to the Legislative Council, making subordinate legislation or dissolving the Legislative Council. Article 52 stipulates circumstances under which the Chief Executive must resign. Examples include the loss of ability to discharge his or her duties or refusal to sign a bill passed by a two-thirds majority of the Legislative Council. The acting and succession line is spelled out in Article 53. If the Chief Executive is not able to discharge his or her duties for short periods (such as during overseas visits), the duties would be assumed by the Chief Secretary for Administration, the Financial Secretary or the Secretary for Justice, by rotation, in that order, as acting Chief Executive. In case the position becomes vacant, a new Chief Executive would have to be selected. Prior to the handover in 1997, the office of the Chief Executive-designate was at the 7th floor of the Asia Pacific Finance Tower. When Tung Chee-hwa assumed duty on 1 July 1997, the office of the Chief Executive was located at the 5th floor of the Former Central Government Offices (Main Wing). In the past the governor had his office at Government House. Tung did not use Government House as the primary residence because he lived at his own residence at Grenville House. Donald Tsang decided to return to the renovated Government House during his first term, and moved in on 12 January 2006, for both his office and residence. In 2011, the office of the Chief Executive moved to the low block of the new Central Government Complex in Tamar. Government House continues to serve as the official residence of the Chief Executive. Upon retirement, former chief executives have access to office space at the Office of Former Chief Executives, 28 Kennedy Road. The office provides administrative support to former Chief Executives to perform promotional, protocol-related, or any other activities in relation to their former official role. The activities include receiving visiting dignitaries and delegations, giving local and overseas media interviews, and taking part in speaking engagements. A chauffeur-driven car is provided to discharge promotional and protocol-related functions. Depending on Police risk assessment, personal security protection is provided. Former Chief Executives also enjoy medical and dental care. The former Chief Executive holds the title "The Honourable", and ranks third in the Hong Kong order of precedence. Remuneration for the Chief Executive of Hong Kong is among the highest in the world for a political leader, and second only to that of the Prime Minister of Singapore. The pay level took a cue from the handsome amounts paid to the city's colonial governors – worth $273,000 per annum plus perks in 1992 – and is 25 times more than that of Xi Jinping, the General Secretary of the Communist Party of China (highest position in China). In 2005, Chief Executive Tung Chee Hwa received some HK$3 million ($378,500) in pay. From 2009 until the end of 2014, the salary for the job stood at HK$4.22 million. In January 2015, CY Leung reversed a pay freeze imposed in 2012, resulting in its increase to HK$4.61 million ($591,000). In July 2017, Directors of Bureau (DoBs) were approved to have a 12.4% pay rise and the 3.5% pay differential between Secretaries of Departments (SoDs) and DoBs remained, indicating a new annual pay of approximately HK$5 million for the city's leading role because the Chief Executive received a salary of 112% of the Chief Secretary. Since the Chief Executive is elected by a committee of 1,200 select people, rather than the general population, many people, in particular the pro-democrats, have criticised the office as undemocratic, and have criticised the entire election process as a "small-circle election." Many events, including 2010 events such as the Five Constituencies Referendum have attempted to push for greater democracy and universal suffrage. In January 2015, when CY Leung reversed a pay freeze imposed on the CE and senior civil servants in 2012, he was accused of granting himself a pay rise by stealth and going against the trend of top politicians taking pay cuts instead of pay increases. ^ Resigned, Donald Tsang served as acting Chief Executive from 12 March to 25 May 2005 and Henry Tang acted from 25 May to 21 June 2005. ^ "Government Structure" (PDF). Hong Kong: The Fact. September 2017. Retrieved 6 October 2017. ^ Article 43, Hong Kong Basic Law: "The Chief Executive of the Hong Kong Special Administrative Region shall be the head of the Hong Kong Special Administrative Region and shall represent the Region"
^ "Bill 1999." Info.gov.hk. Retrieved 28 March 2010. ^ Article 56, Hong Kong Basic Law. ^ "Precedence list Archived 4 October 2009 at WebCite." Protocol.gov.hk. Retrieved 28 March 2010. ^ "Carrie Lam receives Hong Kong leadership appointment from Premier Li Keqiang". Hong Kong Free Press. Chief executive-elect Carrie Lam received her appointment order from Chinese Premier Li Keqiang on Tuesday morning to serve as Hong Kong’s next leader, beginning July 1. ^ a b c d e f g "HK Basic law Archived 25 February 2012 at the Wayback Machine." Basiclaw.org.hk. Retrieved 28 March 2010. ^ "Nomination of Candidates" Archived 25 February 2012 at the Wayback Machine." HK Electoral Affairs Commission. Retrieved 28 March 2010. ^ Chan, Ming K.  (1997). The Challenge of Hong Kong's Reintegration With China. Hong Kong University Press. Hong Kong (China). ISBN 962-209-441-4. ^ "United States Hong Kong Policy Act Report. Archived 27 May 2010 at the Wayback Machine. US Consulate Hong Kong. Retrieved 28 March 2010. ^ "Cap. 569 Chief Executive Election Ordinance". Hong Kong e-Legislation. ^ CEO.gov.hk. "Executive Council." Retrieved on 28 March 2010. ^ Info.gov.hk. "Acting Chief Executive's opening statement." Retrieved on 28 March 2010. ^ Legco.gov.hk. "HEAD 21 – CHIEF EXECUTIVE'S OFFICE." Retrieved on 28 March 2010. ^ Harbourdistrict.com.hk. "Harbourdistrict.com.hk." Sample letter with address. Retrieved on 28 March 2010. ^ NYtimes.com. "Tung Chee-hwa: Shipping Tycoon Chosen to Govern Hong Kong." Retrieved on 28 March 2010. ^ Info.gov.hk. "CE moves into Government House today." Retrieved on 28 March 2010. ^ 28 Kennedy Road 堅尼地道28號 / 皇仁書院 / 金文泰中學 圖說香港歷史建築. Flickr. Retrieved 4 October 2014. ^ "Administration Wing, Chief Secretary for Administration's Office – Office of Former Chief Executives". 17 January 2011. Retrieved 4 October 2014. ^ "Press Releases". Retrieved 4 October 2014. ^ Timmons, Heather. "Hong Kong's little-loved leader is one of the world's best-paid politicians". Quartz. ^ a b "Leung under fire for lifting pay freeze on himself, top team". HK Economic Journal. 19 January 2015. ^ "Remuneration package for Politically Appointed Officials serving in fifth-term HKSAR Government". www.info.gov.hk. Retrieved 2018-02-11. ^ 林鄭當選：年薪近500萬元　享優厚福利. on.cc東網 (in Chinese). Retrieved 2018-02-11. ^ United States State department "Background note: Hong Kong." Retrieved on 28 March 2010. ^ Taiwanauj.nat.gov.tw. "HK-mainland China 1 democracy in the new HK: Is it reality or. Archived 30 August 2011 at the Wayback Machine Retrieved on 28 March 2010. ^ ""DAB is ready to rumble in suffrage polls"." The Standard. Retrieved on 28 March 2010. Wikimedia Commons has media related to Chief Executive of Hong Kong. 1 The Chief Executive serves as the President of the ExCo, but is not a member of the ExCo.